Bivalvia, in previous centuries referred tae as the Lamellibranchiata an Pelecypoda, is a cless o marine an freshwatter molluscs that hae laterally compressed bouks enclosed bi a shell conseestin o twa hinged pairts. 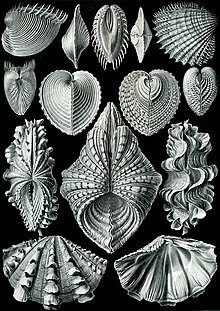 Bivalves as a group hae na heid an they lack some uisual molluscan organs lik the radula an the odontophore. ↑ Jell, Peter A. (1980). "Earliest known pelecypod on Earth — a new Early Cambrian genus from South Australia". Alcheringa: An Australasian Journal of Palaeontology. 4 (3): 233–239. doi:10.1080/03115518008618934. ↑ Runnegar, B.; Bentley, C. (January 1983). "Anatomy, ecology and affinities of the Australian early Cambrian bivalve Pojetaia runnegari Jell". Journal of Paleontology. 57 (1): 73–92. JSTOR 1304610. This page wis last eeditit on 11 Apryle 2017, at 00:23.